No history on the long ridge? When I was told the name ‘Under a Grey Sky’, only one thought popped into my head; home. Growing up in Lurgan there were plenty of grey skies overhead. I’m not saying it was dull, grey and boring – although it was at times like that – it is merely a passing comment on the usual state of the weather in that part of Ireland. For the sake of clarity I should point out there are several town lands of Lurgan in Ireland, one in Co. Galway, one in Co. Mayo and one in Co. Cavan. 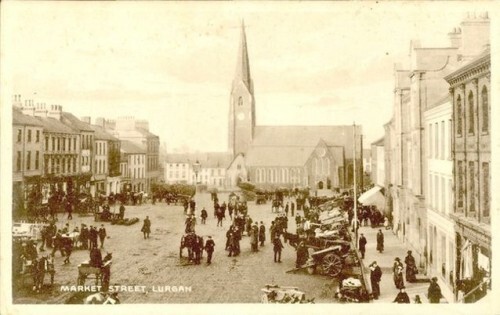 The Lurgan I spent the first nineteen years of my life is situated in Co. Armagh in the often disputed six north-eastern counties of Ireland. For those who don’t know, the name Lurgan is the anglicised re-branding of the original Gaelic name an Lorgain which means ‘the long ridge’. In the nineteen years I spent in Lurgan before departing its designated electoral boundaries, I can honestly say that not much out of the ordinary really happened. Some may dispute this or say I have lightly glossed over the previous number of decades of conflict, but to that I would say that for my generation that was the ordinary. Anyway, back to the long ridge. In the norm people did the everyday things as they do everywhere; school, jobs, marriages, pub and bookies, and not always in that order. It seems that it was the normal drill since time immemorial, or since the plantations. It would be fair to say that there were not many who thought too hard about the history of their surroundings. In school, certainly we were never taught in anything of real depth about our local or indeed national history. History classes in the school I attended seemed more concerned with relaying the exploits of Ferdinand Magellan or the Spanish Conquistadors. All truly fascinating and maybe I am being somewhat over-critical, but to the best of my knowledge, the Conquistadors never made it as far as Lurgan and there has never been a recorded unearthing of golden salamander brooches or similar exotic gold in Lurgan park over the years. I suppose what I am attempting to convey is that there have been generations of people growing up with no sense of the history which surrounds them yet they have been expected to retain knowledge of dates of battles in lands none of them are likely to see in their lifetimes. One aspect of history which every Irish person is aware of, even us Spanish Conquistador experts is the Irish Famine of the 1840s. Many in Ireland (myself included) were badly informed as to the extent of the tragedy and just how far it penetrated into our long ridge. Many Irish people of varying shades in the North were of the belief that the Irish Famine of the 1840s was somehow a Southern or Western Irish disaster and that the more industrialised north-eastern section of the island was somehow immune to the effects. One national daily the Belfast Newsletter in an attempt to endorse some semblance of regional superiority exclaimed: ‘The spectacle of a bankrupt union with a horde of starving paupers, and a ruined peasantry on the brink of pauperism, has not yet been seen in Ulster. That was in 1849, several years into the catastrophe. Indeed, in recent times there have been certain politicians who still felt comfortable propagating that particular myth. At this point I should point out that I refer to the Irish Famine of the 1840s as such, because there have been many famines in Ireland’s modern history, both regional and national, including one in the 1740s which was much more severe than the more well known one of the 1840s. In my time in Lurgan there was the rumour of a famine graveyard near the grounds of the town’s hospital, where, incidentally, I came into this world. Initially people of my own age assumed this was a scare tactic by the older generations attempting to keep us away from the area by playing on our young superstitious beliefs. The area was used as an unofficial gathering point for older ‘bad’ boys for drinking and merrymaking purposes and it was only several years later when I graduated into one of those bad boys myself that I again heard about the fabled famine graves. 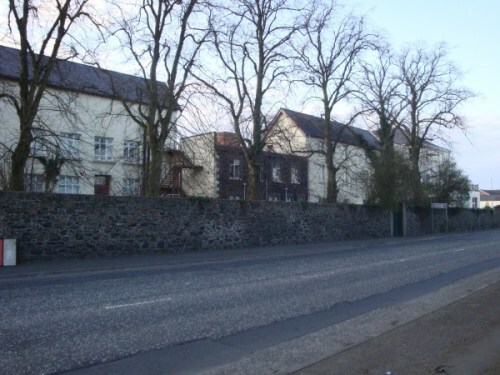 Just over the wall from this outdoor sibín (drinking den) stood, on the grounds of the present day hospital, the old workhouse and fever hospital. A direct result of the 1838 Irish Poor Law was that each district was to have its own workhouse situated centrally in a market town. Designed by English architect and future fellow of the Royal Institute of British Architects, George Wilson it was a grim formula replicated throughout England and Ireland and was designed to deter only the truly desperate paupers from darkening its doors. Newspaper claims that there were no ‘starving paupers’ in Ulster could not have been further from the truth. The town was so badly affected during the Famine years that the town guardians were forced to open up a second workhouse to cope with the overflow of the destitute. One historian personally told me that there were approximately 2,500 famine victims buried in unmarked graves in the very field where I had stood in on many occasions, the worst period of time being from October 1847 to November 1848 when 1,119 unfortunates perished through hunger and disease. I suppose it is only fitting that a history which has been hidden away from so many should be commemorated with a mural which is hidden from public view. 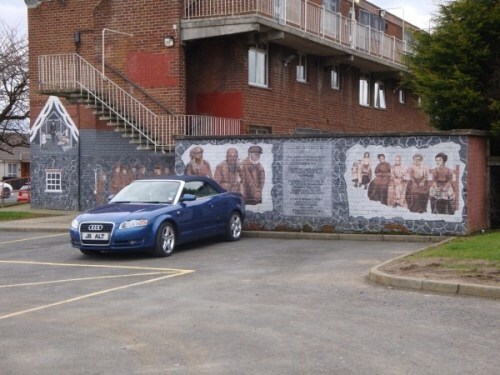 The simple mural was commissioned to remember those who perished behind the workhouse walls and so the mural too lies hidden behind its walls. In a period where public commemorations of disasters in this corner of Ireland are very much in vogue (this year’s most overused word Titanic comes to mind) the estimated two and a half thousand people who died on our doorstep remain relatively forgotten while those who perished 3,000 miles away in the mid Atlantic are remembered with all the pomp and pageantry that Belfast’s city fathers can afford for the simple reason that the purchased a ticket for a doomed liner which was constructed in that city. The sad fact is that in death, as in life, those unfortunate souls just weren’t as marketable as others. This episode can hardly be labelled a glorious history, but then again there aren’t too many glorious histories to look back on. What it is though is a history, not only ‘our’ history but everyone’s history. At a time when we are being urged by the great and the good to embrace our shared history with everything Titanic, we should be prepared to embrace all of our history. If we are not prepared to fully embrace it the least we should be prepared to do is recognise it. The first step in recognising ones history starts with looking around, even in a place which at first, or even second or third glance appears to have no history you may be surprised at what you find you have been standing beside all these years. This entry was posted in Memory, Places on May 16, 2012 by Paul Scraton.